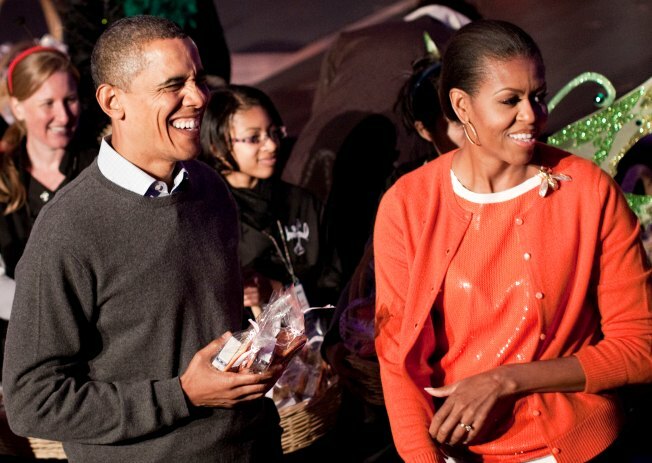 President Barack Obama and his wife, Michelle, handed out Halloween treats to area children and military families at the White House Sunday evening. Local students between 6 and 14 years old, along with children from military families, were invited to celebrate Halloween on the North Lawn. The president and first lady, along with Mrs. Obama's mother, Marian Robinson, spent about 30 minutes passing out goodie bags. Obama wished each child a happy Halloween as he distributed the treats, pausing occasionally for hugs or to comment on costumes. Later, the military families continued the celebration inside the White House. The first couple joked to assembled reporters about children walking the long driveway in order to work off the snacks. 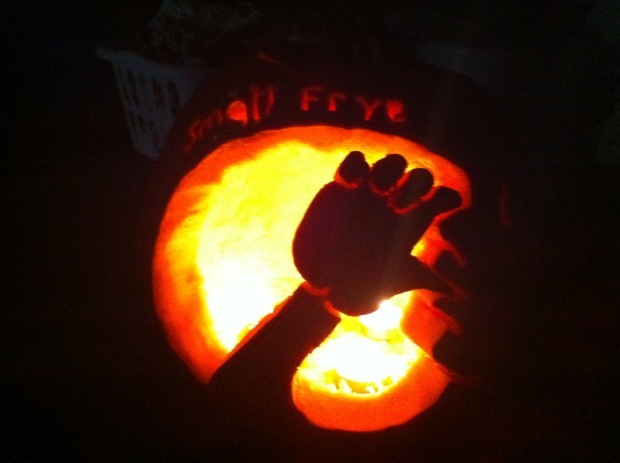 "This is the Let's Move method of trick-or-treating," Obama said, referring to Mrs. Obama's campaign to combat childhood obesity. The goodie bags contained a box of White House M&Ms, a cookie made by pastry chef Bill Yosses, and dried fruit. Trick or treating, haunted houses and ghosts and goblins in Georgetown, the Washington area celebrated Halloween. As they made their way across the lawn, the children meet a vast range of costumed characters ranging from a spooky Frankenstein to the Scarecrow from "The Wizard of Oz." Music from a jazz band dressed in pirate gear rang out across the White House grounds. Multicolored pumpkins and gourds lined the driveway -- individually, in gravity-defying stacks and as part of a large mound over 5 feet tall. Pumpkin-headed scarecrows made of cornstalks loomed over the path with menacingly raised arms. Under the White House portico, a mobile resembling bats flying through clouds fluttered around a lantern. Some of the local trick-or-treaters were students at Bancroft Elementary, which helps tend the first lady's White House garden, and Tubman Elementary, which has a relationship with the White House chefs. 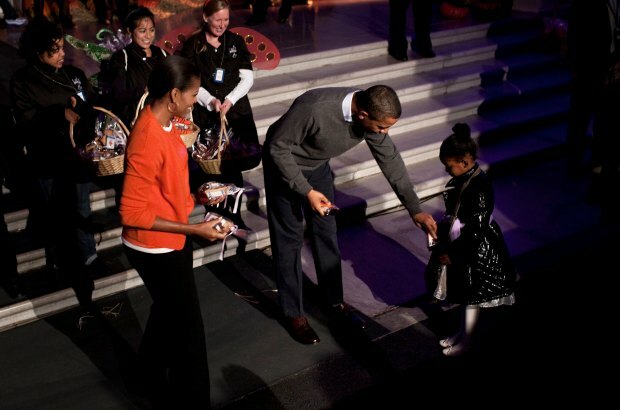 After trick-or-treating ended, the Obamas stood near the front door, welcoming the military families inside, helping children climb the short flight of steps and thanking parents for their service. As for the Obama children ... the president said earlier in the evening that Sasha was dressing up as a turkey (someone asked if he would pardon her -- he said that was a good idea). He didn’t know what Malia was wearing. He said the girls were going to friends’ homes to trick-or-treat and would then come back to the White House.